Osama Bin Laden came from a family with strong ties to the Royal Family in Saudi Arabia. Osama Bin Laden’s father was responsible for many of the building projects and even loaned the Royal family money. Saudi Arabia was a poor country until the discovery of oil which led to an abundance of wealth. Osama inherited part of his father’s construction company. Osama believed his home country of Saudi Arabia was considered holy land because the prophet Mohammed was born in the city of Mecca. Osama himself oversaw the re-construction of this Mosque. Osama had gone from a hometown hero to a terrorist. Osama even called out the Royal family and in particular King Fahd for not living as a strict Muslim. Osama had already founded al-Qaeda and was training in Sudan. King Fahd was furious over the reports he was hearing coming out of Sudan of all the terrorists activities Osama was claiming to be involved with. On March 5, 1994 King Fahd revoked Osama's citizenship. Osama lost his seven million dollars inheritance from his fathers company. Osama later had the chance to apologize to King Fahd on record for a chance to regain his citizenship but refused. 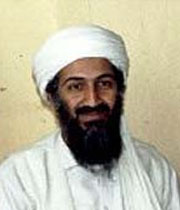 Osama Bin Laden was asked for his passport after King Fahd revoked his citizenship.